Insomnia is a condition that occurs when a person in unable to get long enough or refreshing enough sleep at night. Insomnia can result from an inability to fall asleep, an inability to stay asleep, or waking too early before having gotten enough sleep. Insomnia is a disorder in which people are unable to get enough, or enough restorative, sleep because of one or more factors. People with insomnia often have daytime symptoms related to a lack of sleep, such as daytime sleepiness, fatigue , and decreased mental clarity. There are two main types of insomnia. One is acute insomnia (sometimes called transient insomnia). This type occurs when insomnia symptoms exist over a reasonably short period of time. The other type is chronic insomnia, which is diagnosed when the symptoms manifest themselves over a longer period (generally more than one month). Insomnia can also be classified as either primary or secondary. Primary insomnia is a disorder that cannot be attributed to another condition or disorder. Secondary insomnia can be traced back to a source, which may be a medical condition; the use of medications, alcohol, or other substances; or a mental disorder such as severe depression. Not all disruptions in the normal pattern of sleeping and waking are considered insomnia. Such factors as jet lag, unusually high levels of stress , changing work shifts, or other drastic changes in the person's routine can all lead to sleep problems. Unless the problems are ongoing and severe enough that they are causing distress for the person in important areas of life, he or she is not considered to have insomnia. The symptoms of insomnia can vary greatly from person to person. Some people find that they have trouble falling asleep at night and can lie in bed for hours without being able to drift off. Others find that they fall asleep easily but wake many times during the night. Other people awaken too early in the morning and are then unable to get back to sleep. Some people even get enough hours of sleep but find that they do not feel rested, often because their sleep is too light. Not all people experiencing insomnia have symptoms that occur during the daytime, but many do. Some people experience such symptoms as reduced ability to concentrate or pay attention, decreased alertness, and mental sluggishness. Some people have trouble staying awake. More people think that they have this symptom than actually do. Upon clinical examination many people who think that they are excessively sleepy during the day actually are not. Many different things are thought to cause or contribute to insomnia. Such stressors as starting a new job or changes in routine, such as beginning to work a different shift, can lead to temporary sleep problems. Sleep problems can become aggravated, and persist after the worry or change causing the sleep problem has been resolved. This persistence is thought to be related to the anxiety created by attempting to go to sleep and not expecting to fall asleep. Anxiety about sleep loss can lead to a vicious circle in which the person has more and more concern about being able to fall asleep, making it ever increasingly difficult to do so. Some people even report that they are better able to fall asleep when they are not in their beds. This relative success is thought to occur because the new environment is not associated with the fear and anxiety of not being able to sleep, therefore making it easier to fall asleep. Many other factors are thought to lead to or perpetuate insomnia. These include drinking tea or coffee, eating a large meal, taking certain medications or drugs of abuse (cocaine, amphetamines ) that have a stimulating effect, or exercising heavily in the hours before attempting to sleep. Also, attempting to sleep in a room with too much light or noise can make it harder for some people to sleep. Doing activities in bed that are not associated with sleep, such as reading or watching television, can make it more difficult for some people to fall asleep when they finally want to. Sleep may be even more difficult if the television show or book was frightening or upsetting. There are many different opinions about how much of the general American population experiences insomnia. Estimates suggest that around 5–20% of the adult population suffers from some form of insomnia or long-term sleeping problems. Nearly half report at least occasional sleeping problems. Accurate data is difficult to gather, as many people misperceive how much sleep they actually get and how many times they normally wake up during the night. It is generally agreed, however, that women are more likely than men to suffer from insomnia. As people get older, they are also are more likely to experience insomnia. 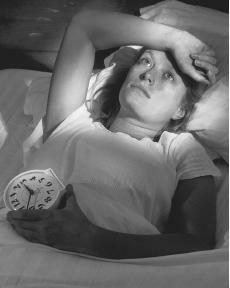 People who are nervous or tense are more likely to have insomnia than those who are not. Lastly, people who live near airports or other sources of nighttime as well as daytime noise have higher rates of insomnia than the general population. According to the Diagnostic and Statistical Manual of Mental Disorders ( DSM-IV-TR ), which presents the guidelines used by the American Psychiatric Association for diagnosis of disorders, in order to be diagnosed with primary insomnia, a person must experience the symptoms for at least a month, and the symptoms must cause them distress or reduce their ability to function successfully. The symptoms cannot be caused by a different sleep disorder, a medical condition, or be a side effect of medications or substance abuse. Insomnia may also be comorbid with (occur together with) other psychiatric disorders, including mania, depression, and the anxiety disorders. Insomnia is a disorder that is usually self-reported; that is, patients usually bring up the subject of sleep problems with their doctors rather than the doctor suggesting the diagnosis. There are no laboratory tests for insomnia, but the doctor may suggest keeping a sleep diary, in which the patient notes the time they went to bed, the time(s) at which they got up during the night, their activities before bed, etc. Sleep diaries can be helpful in uncovering specific factors related to the insomnia. Many treatments have been explored for treating insomnia, in a number of different settings. The patient may wish to consider consulting a sleep clinic or a doctor who specializes in the treatment of sleep disorders as well as their family doctor. Behavioral and educational therapies are usually tried first, because they do not have side effects and cannot create a chemical dependence the way some sleep medications can. Many different approaches have been designed to help patients whose insomnia is linked to particular factors. One common behavioral therapy involves changing any pre-bedtime activities or behaviors that might interfere with sleep. Avoiding large meals, alcohol or caffeinated beverages, or intensive exercise in the hours before bedtime may help the patient to fall asleep. Another non-medicinal treatment for insomnia involves controlling the patient's mental associations with the bedroom. The patient is trained to associate the bed only with sleep, not with the frustration of trying to fall asleep or with such waking activities as reading or watching television. As part of this training, if the patient cannot sleep after a certain amount of time, he or she is instructed to get out of bed and spend time somewhere else in the house doing an activity that they find relaxing. The patient lies down again only when sleepy. This technique helps to prevent frustration from trying to sleep. People with insomnia do not get enough restorative sleep, and often have daytime symptoms such as daytime sleepiness, fatigue, and decreased mental clarity. it may help them fall asleep more easily and to stay asleep longer at night. Teaching relaxation and the ability to concentrate on relaxing thoughts or images can also help patients experiencing insomnia. Most of these therapies also include setting times for waking and having the patient stick to them even if he or she has not gotten a full night of sleep. The elimination of all daytime napping can help to facilitate sleep at night. These treatments are effective by themselves but may also be combined with other approaches. The course of treatment depends on the patient's specific symptoms. Many different medicines, which are called hypnotics, are used to treat insomnia. These are usually not recommended for use for longer than a week because they may cause dependence. In addition, there is always the risk of side effects. There are many different types of hypnotics, and choosing one for a patient depends on the patient's symptoms, other drugs that he or she may be taking, any medical or psychological conditions, and other health factors. Medication treatment is best used in coordination with a behavioral therapy program. Alternative remedies for insomnia, particularly herbal preparations, should be mentioned because they are among the most popular nonprescription treatments for sleep problems. According to Prevention magazine, insomnia is the sixth most common condition treated with herbal formulas in the United States; it accounts for 18% of all use of herbal preparations. Some herbs used for insomnia are safer than others. Persons who are using alternative remedies, whether to treat insomnia or other conditions, should always tell their doctor what they are taking, how much, and how often . This warning is important because some herbal preparations that are safe in themselves can interact with prescription medications. Untreated insomnia has potentially serious consequences, including an increased risk of motor vehicle accidents, impaired school or job performance, and a high rate of absenteeism from work. Fortunately, insomnia can be treated very effectively in most patients. Treatment using a combination of approaches is usually most effective. Patients who have had insomnia once are at an increased risk for recurrent insomnia. Pelletier, Kenneth R., MD. The Best Alternative Medicine , Part II, "CAM Therapies for Specific Conditions: Insomnia." New York: Simon and Schuster, 2002. Sadock, Benjamin J. and Virginia A. Sadock, eds. Comprehensive Textbook of Psychiatry, 7th edition, Vol. 2. Philadelphia: Lippincott Williams and Wilkins, 2000. Long, Scott F. "Preventing and Treating Insomnia" Drug Topics 144, no. 13 (July 3, 2000): 49. Phillips, Grant T., Jeremy Holdsworth, Scott Cook. "How useful is cognitive behavioral therapy (CBT) for the treatment of chronic insomnia?" Journal of Family Practice 50, no. 7 (July 2001): 569.